London, UK: A modern building sensitive to its historic setting is designed to captivate and educate visitors who want to see millions of bottled zoological specimens and the scientists who study them. Designing a museum of any type is fraught with any number of aesthetic and technological challenges. The challenges in designing a modern museum and research center in a historic setting can be absolutely daunting. A case in point is the Darwin Centre Phase One, designed by the London office of HOK International. 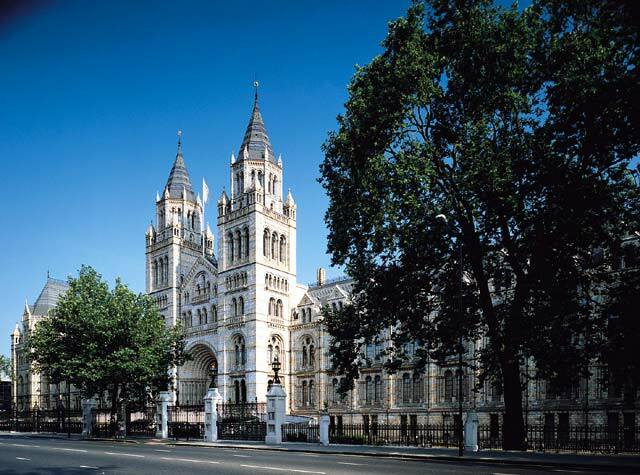 The 123,789-square-foot (11,148-square-meter) Centre is located behind The Natural History Museum, one of London’s grandest Romanesque Revival buildings, designed by Alfred Waterhouse and completed in 1880. It is also one of the world’s leading research institutions, housing well over 70 million plant, animal, fossil, rock, and, mineral specimens gathered over 400 years. 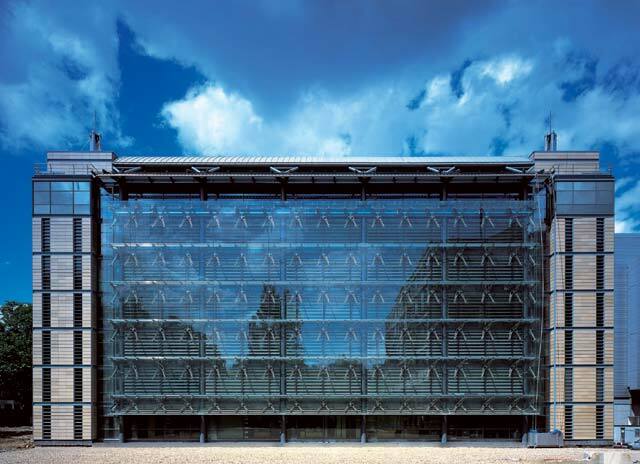 The building is comprised of three sections: in the front, behind the glass facade, are the offices and laboratories where scientists can be seen at work; at the back is the seven-story cold store for the specimens; separating the two is an atrium allowing the public entrée to the heart of the building. 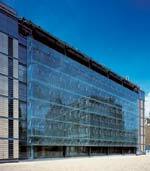 The contemporary all-glass façade is hung from 104 person-sized zoomorphic brackets specially designed for the Darwin Centre. Their rounded forms and organic styling recall the preserved specimens the building stores. 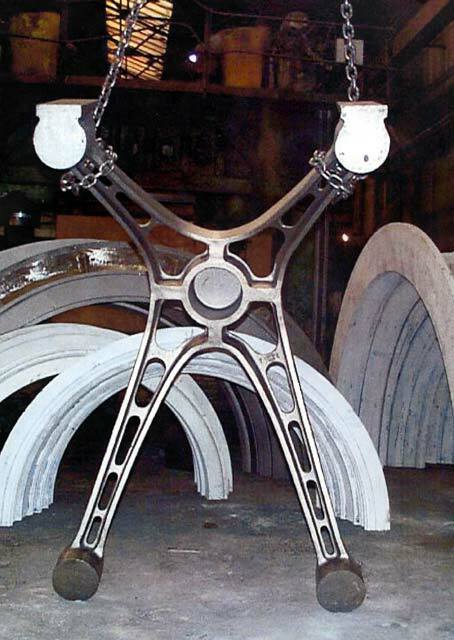 The cast alloy steel supports are electroless nickel-plated giving them a matt metallic finish with warm ochre tones. 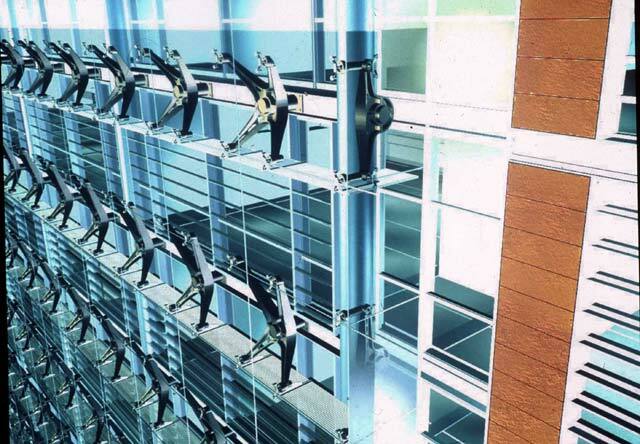 They are bolted onto the structure of the building and have stainless-steel "spiders" that hold the glass in place. The “solar wall” has louvers sandwiched between two layers of glass. 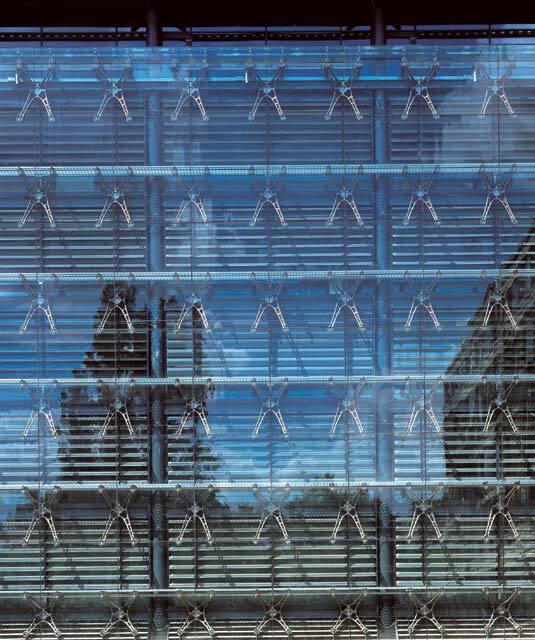 The louvers are computer-controlled to track the sun, giving the building an “intelligent skin” which changes constantly according to weather conditions and the time of day. As the sun warms the louvers they draw air up from ground level and out through a linear “chimney” at the top floor providing a highly efficient cooling mechanism. 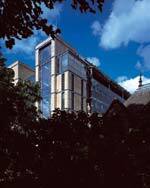 The louvered glass facade can be seen from busy Cromwell Road giving passersby an ever-changing view. 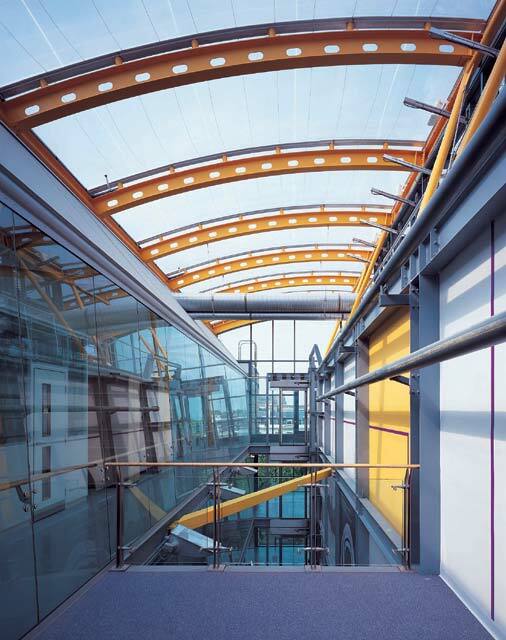 Light filters down into the wedge-shaped atrium through the caterpillar-like roof – a Teflon "duvet" of ETFE (Ethyl Tetra Flouro Ethylene) inflated foil cushions. It is a transparent foil and should last for at least 30 years before being recycled and replaced. It is self-cleaning, anti-static, very strong, transparent to UV light, and is printed with dots (fritted) to reduce heat gain. 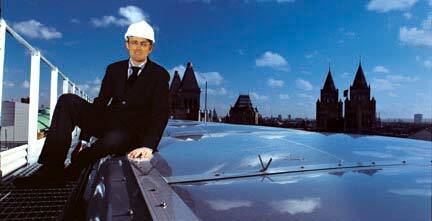 The lightweight roof requires minimal structure to support it, and the layers of air make it thermally efficient. ETFE, also used for the Eden Project, is delivered in sheets, inflated on site, and is rigid when inflated to full pressure. The terracotta rain screen creates an architectural contrast to the transparency of the glass façade, and refers directly to the main Natural History Museum building. German manufacturer NBK produced a special batch with subtly modulated variations of color in a palette drawn from the original terracotta of the Waterhouse building. 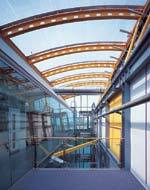 Inside, glass partitions allow guided tour groups to observe scientists at work in the laboratories from the atrium gallery walkways. Private offices are grouped at the southern end. 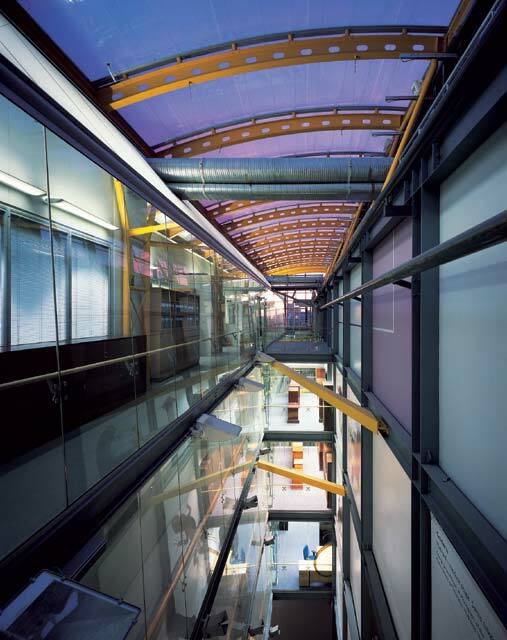 Service spines remove the need for suspended ceilings allowing eight stories of work space within the building, whose height was subject to planning restrictions. Untreated concrete ceilings add to the bare industrial aesthetic of the building. Careful consideration and cutting edge technology have been used to provide a controlled environment and avoid any potential hazards posed by the spirit used to preserve the collection. 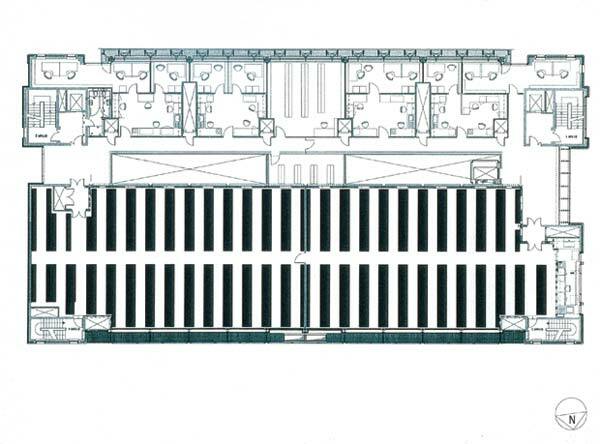 The entire seven-story storage area is chilled to below the flashpoint of the alcohol. 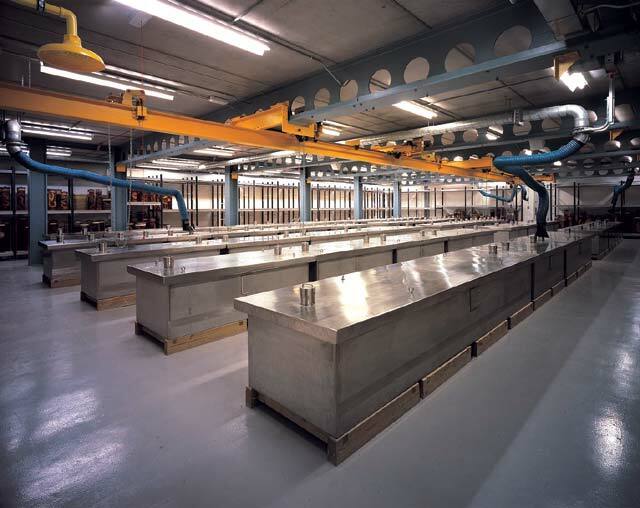 Air ductwork to the collection contains gas detectors to sense whether there has been any spillage of alcohol. If vapor is detected, the mechanized plant switches to full-extract mode to dispel dangerous vapor harmlessly to the outside. According to Brian Fishenden, HOK project manager for the Darwin Centre, architects, contractors and suppliers all excelled at meeting the unique challenges posed by the brief. "At first, the suppliers and contractors found it difficult to imagine how we could construct this rather unusual building. They had to invent new ways of doing things to solve problems that at first seemed insoluble," he says. 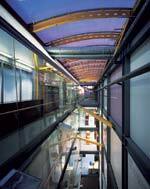 "Take the curtain wall of glass in front of the labs and offices, for instance. The brief required a fully vapor-sealed system and this had never been dealt with in such great detail before. The design team lead the installers into developing the system to perform beyond levels that even the manufactures had envisaged." The HOK master plan for the Natural History Museum site organizes life sciences to the western end and earth sciences to the east. 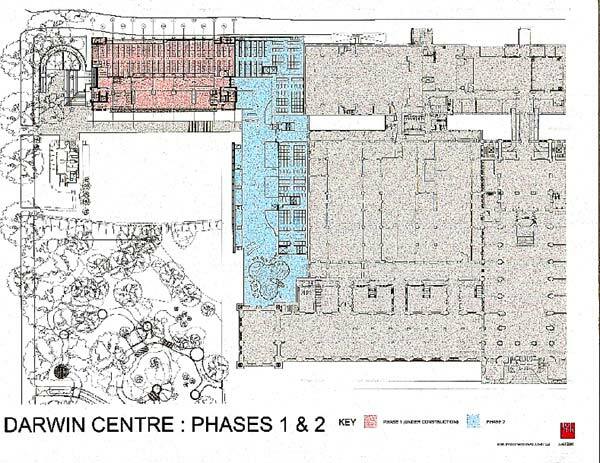 The completion of Phase One of the Darwin Centre is the first stage in the complete re-modeling of the western end of the site which, when finished, will form a life sciences center housing the zoology, botany, and entomology collections. The Natural History Museum is currently engaged in a fundraising campaign to raise the remaining funds to complete Darwin Centre Phase Two, being designed by the Scandinavian firm C.F.Møller and Partners, which will house the museum’s 28 million insects and six million plants. HOK International Ltd. offers specialist skills to meet the needs of commercial developers, corporations, the hospitality industry, sport, and public institutions. With a staff of 250 in London, HOK is one of the largest architectural and interior design firms in Europe with emphasis on work in the commercial, corporate, and public sectors. HOK International Ltd is part of a global network of offices on four continents with staff of over 2,000 people serving clients by improving the built environment. Zoomorphic (spider-like) brackets, as tall as a person, hold the glass to the façade. Natural light fills the atrium through a caterpillar-like roof - a Teflon "duvet" of ETFE (Ethyl Tetra Flouro Ethylene) inflated foil cushions. 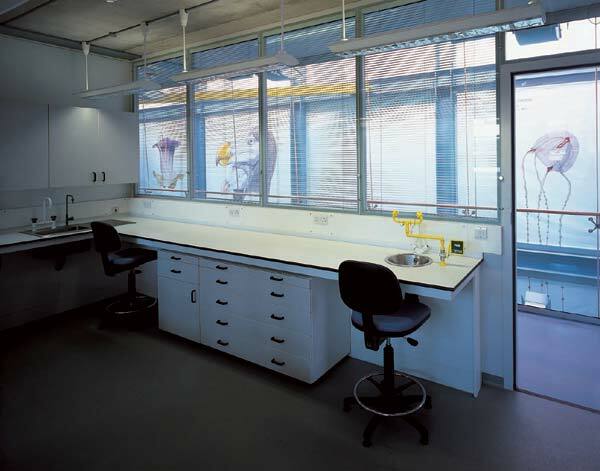 A typical laboratory has windows into the atrium.